The ingredients in your own meals are no longer just people food. Share them with your best friend! Nobody keeps us company in the kitchen as faithfully as our dogs. As patiently as dogs wait, they are often disappointed by their same boring bowl of food, which is missing many important nutrients. The wait is over—here comes CHOW ! CHOW shows you the benefits of more than 100 foods that can be simply added to the dog bowl or combined with a few other ingredients to make a quick meal loaded with real meat, healthy fats, and antioxidants. Each simple recipe is accompanied by information on the powerhouse of nutrients that work to keep your pet happy and healthy. Think your dog won’t eat a blueberry? Try providing it frozen, cut in half, or dried, and even an old dog will start learning new tricks. 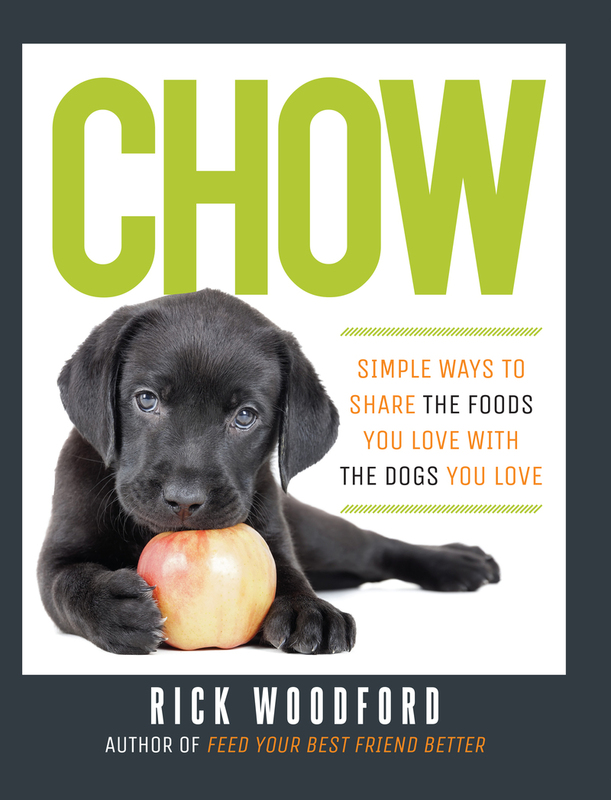 Whether it's scraps from the cutting board or a low-calorie meal, your dog will love you even more when you provide something better in the bowl—with CHOW ! Rick Woodford began cooking food for his dogs after his dog Jackson was diagnosed with cancer and given a year to live. Woodford resolved to send Jackson out with style by cooking him food usually reserved for humans, only to find out the transition to human food made Jackson feel better and live for four additional years, cancer-free. Woodford specializes in canine nutrition and assisting dogs with serious illnesses. He lives near Portland, Oregon. Fang and claw have jumped the white picket fence as encounters with cougars in Chicago, alligators in Florida, and bears virtually everywhere have become increasingly commonplace. Author Edward Ricciuti explores cutting-edge research into why it’s happening, how it impacts all of us, and how to deal with it on both societal and personal levels. Here is a book to enhance our appreciation of the small citizens of the world and to introduce us to the neighbors we never knew we had, from spotted salamanders to meadow voles, from snowy tree crickets to ambrosia beetles, all living within steps of your door. The story of how land can blossom—literally—with proper management. The help you need identifying the dormant but visible vestiges of spring and summer wildflowers and other plants. Take some of the mystery out of a walk in the woods with this new field guide from the author of Reading the Forested Landscape . A full-color, pocket-sized field guide to more than 200 wildflowers found in and on Cape Cod's dunes, heathlands, bogs, roadsides and woodlands. A remarkable account of Montana's efforts to save its trout streams and rivers from pollution and neglect. From acclaimed author and naturalist Robert Finch, a richly detailedobservance of Cape Cod's seemingly vanished natural and human past, asit clings to its present landscape. Landscape is much more than scenery to be observed or even terrain to be traveled, as this fascinating and many-layered book vividly shows us. Etched into the land is the history of how we have inhabited it, the storms and fires that have shaped it, and its response to these and other changes. A photographic and informative guide to over 160 varieties of wildflowers in the Berkshires. Look to the Mountain is one of the most popular and enduring American novels of the past century.